Join me Thursday, August 18th, for a live and interactive FutureofEducation.com webinar with Jeff Piontek, Head of School at Hawaii Technology Academy, on on education change and reform. Jeff Piontek is an author, keynote speaker and teacher (most importantly). He has worked with many at-risk school districts nationally as a consultant on affecting educational change and reform. Jeff started out as a Science teacher in the South Bronx, NYC and worked his way up to the Director of Instructional and Informational Technology in NYC. Jeff's latest book; Blog's Wiki's and Podcast's, Oh My! Electronic Media in the Classroom has been well received by the education community and is in its second printing. His newest book will be released in March and continues his work on STEM education and 21st Century Skills. He has received many accolades including the latest from Governor Linda Lingle for Innovation in the economy for his STEM education work nationally. 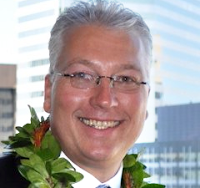 Jeff sits on the National Governor's Association STEM committee as well as the State of Hawaii Economic Development Workforce Committee, which he was appointed to by the Governor. Jeff has embarked recently on a new venture at Hawaii Technology Academy and the school has performed at the top of the public schools in Hawaii its first year and doubled to 500 students in its second year.